Can Egypt Protect Its Ancient Monuments? The euphoria with which Egyptians greeted the ouster of Hosni Mubarak in February was quickly tempered by the news—at first denied by officials, but later confirmed—that thieves had stolen several priceless objects from the Egyptian Museum, including pieces from the tomb of the pharaoh Tutankhamun, among them a gilded wooden statuette of the king and a silver trumpet. Over the next few days, there were more alarming reports: police throughout Egypt had abandoned their posts, leaving hundreds of archeological sites unguarded. A few weeks later, Zahi Hawass, the director of Egypt’s Supreme Council of Antiquities, resigned. Though he later resumed his post as minister of archeological affairs, the SCA was left rudderless and confused in his absence. Gangs of armed treasure hunters took advantage of the chaos and began plundering ancient tombs and antiquities storerooms throughout Egypt. The robberies are ongoing and thought to exceed 400 incidents so far. Antiquities theft is as old as the pyramids, but never before has it so shocked Egyptians. The Egyptian press voiced the public’s revulsion at the desecration, and hundreds of youthful protestors and ordinary citizens in Cairo and Luxor volunteered to stand guard at museums and archeological sites. It was a noble gesture but a futile one. There are simply too many sites to protect in such an ad hoc way. In truth, no one knows how many archeological sites are in Egypt: 5,000 is an oft-quoted figure, but other experts say there are many more. Some sites are tiny—graffiti scratched on a cliff face, or a small cemetery. 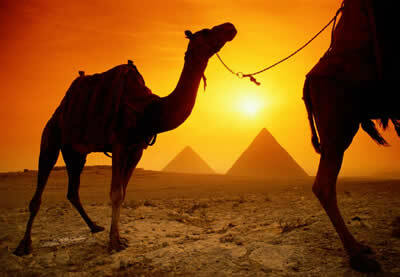 Others, like Giza, cover several square kilometers filled with thousands of tombs and pyramids. Thebes (modern Luxor) boasts thousands of tombs, temples, shrines, and villages. The Valley of the Kings alone is chockablock with scores of elegantly decorated tombs, including that of the boy king Tutankhamun. Sites lie beneath the streets of modern cities, in fields along the Nile, in desert wastelands, and distant oases—even beneath the Mediterranean and the Red Sea. They span thousands of years and represent several cultural and religious traditions—Neolithic, dynastic Egyptian, Greek, Roman, Jewish, Christian, and Muslim. In Egypt, one is rarely out of sight of an ancient monument. Unfortunately, it is no exaggeration to say that every one of them is threatened with destruction—and theft and vandalism are the least of the problems. The graver threats are more subtle: changes in the environment, such as increasing temperatures and humidity, air pollution, and rising ground water; the expansion of industries, farms, and cities into archeological zones; and, perhaps worst of all, the growth of mass tourism and the burgeoning infrastructure required to support it. The job of the SCA is to protect Egypt’s historical sites, but it’s an uphill battle being fought with a limited and outdated arsenal. The SCA is a bloated bureaucracy. It employs 58,000 people; about two thirds are local security guards, poorly paid, untrained, and unarmed. There are also between 20,000 and 30,000 Tourist and Antiquities Police, part of the Ministry of the Interior (not the SCA), who are posted at sites and museums most heavily visited by foreign tourists. Though a pervasive presence, they are an unreliable one, as demonstrated by their immediate and wholesale disappearance early in the revolution. Many still have not returned to duty. The SCA’s on-site inspectors, who are supposed to administer and preserve the country’s heritage, are underpaid and unmotivated. Most are young and—for the first few years, at least—enthusiastic about their job. But the low salary and near-universal reluctance of their superiors to delegate authority leads to frustration. A large number leave to become tourist guides. Instead of taking 300 Egyptian pounds a month from the SCA (about $50), they can earn six or seven times that amount as guides. Besides staffing problems, the SCA is perennially underfunded, even though archeological tourism generates considerable income. In December 2010 ticket sales to sites in Luxor alone earned $30 million for Egypt. But much of this money goes to the government treasury, and the SCA routinely postpones or ignores conservation, maintenance, documentation, and tourist management because of a lack of funds. Meanwhile, the number of visitors to archeological sites increases every year. The Valley of the Kings, which had perhaps 100 visitors a day in 1970, had 8,000 a day in December of last year, and the Ministry of Tourism hopes for 15,000 a day by 2015. The pressures such numbers inflict on tombs and temples are enormous. Yet no long-term comprehensive management plan to protect them has yet been agreed upon. Tourism is a major pillar of the Egyptian economy, and given the income that archeological sites generate, one might think their protection would be a primary goal. After all: no sites, no money. But almost every branch of government wants some control over that income and wants as much of it as possible for themselves, focusing only on short-term gain. Since the revolution, the number of tourists has dropped dramatically, and one can imagine that the SCA will now feel even more financial pressure. Typical of the shortsighted schemes is Luxor’s multimillion-dollar development plan to increase tourist numbers and revenue. The plan is already doing irreparable harm to many of Luxor’s monuments, demolishing historic buildings, paving over archeological sites, moving whole villages and thousands of Egyptians far away from tourist centers and ancient monuments. Many archeologists and tourists, as well as many locals, believe that these acts are turning the largest archeological zone in the world into a gaudy theme park designed only to make money in the short term, with little concern for long-term protection or the needs of Luxor’s residents. Consult with local and international agencies and specialists to develop and implement long-term management plans. Train on-site inspectors and give them greater responsibility. Design better security for sites and museums. Allocate more money for site conservation and documentation. Take a strong stand against commercial and political interests that threaten the monuments. Egypt’s archeological patrimony is humankind’s as well, and requires urgent efforts if it is to be saved for future generations. Egypt’s revolution, and the energy of the youth that drove it, captured the world’s imagination and gave renewed hope for the country’s future. It would be a tragedy if this were not also translated into a renewed commitment to its past.